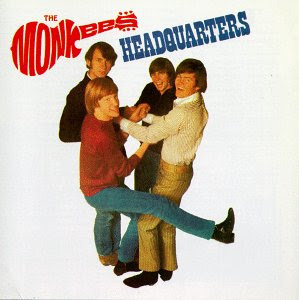 Here is the Monkees' third album, Headquarters, in glorious mono. You can access the album at http://launch.groups.yahoo.com/group/albumania/. This was their third consecutive No. 1 album, and it is, perhaps, the most significant piece of vinyl that they put out during their short period as a musical entity. The story is pretty well known by now. The Pre-Fab Four wanted to be more than just actors in a TV show and singers on their albums. They wanted to have complete and total power over their music, meaning that not only would they pick the tunes, but they would sing and play on them too. Don Kirshner, who was the svengali engineering the Monkees' early successes, held firm, believing that the best way for the foursome to continue their chart dominance was to follow the same formula of having them sing on their albums, on songs that were chosen for them, with only occasional instrumental participation. He felt that this was the right way to go, with only Michael Nesmith really contributing as an all-around performer, writing, producing, singing and playing on one or two self-penned tracks per album. Give Nesmith credit. He could have stayed back, accepted the benefits of being the only Monkee to really contribute to their success musically, and all would have been fine and good. Instead, as the leader of the group, he felt that the talents that Peter Tork, Davy Jones and Micky Dolenz brought to the table were extremely viable and important, and he wanted the public to know that the Monkees were a talented unit beyond the TV show. He got his wish. Kirshner was fired from his position as their musical supervisor, and RCA, Colgems and NBC put their faith in the foursome, and Headquarters is the result. 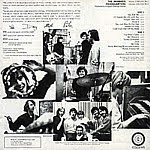 The Monkees, now a real band, played on each track, with help from several outside musicians. They wrote or co-wrote several of the tracks, and pretty much picked which tracks they wanted included on the disk. Monkees fans just love this album, and I think, personally, it is probably, at least, their most fun LP to listen to from top to bottom, and it may very well be their best album in total. Almost every track is a highlight, but incredibly, the tunes written by bandmembers Nesmith, Tork and Dolenz stand head and shoulders above the rest. "Sunny Girlfriend" and "You Told Me" are Nesmith's poppiest concoctions, ear-friendly flower power odes to that time and place. Dolenz's "Randy Scouse Git," known around the world as "Alternate Title," reflects his out-of-left-field songwriting talent, as he sings about a party he had attended where the Beatles held court. The song's title is Liverpudlian slang, and it was banned from the radio under this name in Europe and elsewhere, thus the change to the rather strange alternative name. And Tork ... co-writing "For Pete's Sake" also showed a side of him that probably few knew existed. Used as the Monkees' closing theme during their second season, the song talks in general about freedom, but you kind of get the idea that Tork is also singing (through Dolenz) about his own personal freedom as a musician. Although Jones didn't write any of the songs, he and Tork both shine on "Shades of Gray," maybe the Monkees' most mature tune to date. 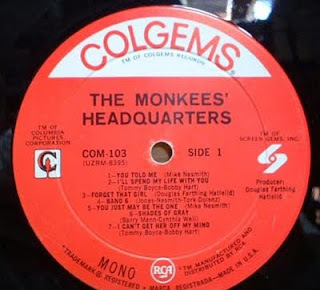 And the Monkees wanted everyone to know how much fun they had creating this LP, and included "Zilch" and "Band 6" to demonstrate this camaraderie that they now enjoyed. One note: "No Time" was credited to Hank Cicalo, a music engineer who worked tirelessly on the album. In reality, the Monkees wrote this tune, but gave it to Cicalo as a gift. RCA was not happy about this, but they eventually went along with this. Years later, Cicalo said that the inclusion of his name as the writer of the song proved a windfall to him, so much so that he bought a house with the money he earned from this "credit." The album vaulted to No. 1 without the benefit of a single released culled from the LP. Any of the above-named tunes would have worked, but the band was so hot then that singles released weren't even matching albums that were available--"Pleasant Valley Sunday" finds it way to their next album. And the LP is the answer to a major trivia question: what album did the Beatles' Sgt. Pepper's Lonely Hearts Club Band supplant as the No. 1 album in America? The answer is Headquarters. And there was some minor controversy over a "beard" cover that snuck its way out into stores, showing Micky, Peter and Mike with some shaggy growth. Reportedly, that album came out in 1968 or 1969 as a rerelease, and is highly sought by collectors, although it is not that uncommon. What could the Monkees do to follow this effort up? Find out next month.